Oil pulling is typically done first thing in the morning, before eating, and can be repeated up to three times per day. If you don’t have time in the morning, you can do it at other times during the day. 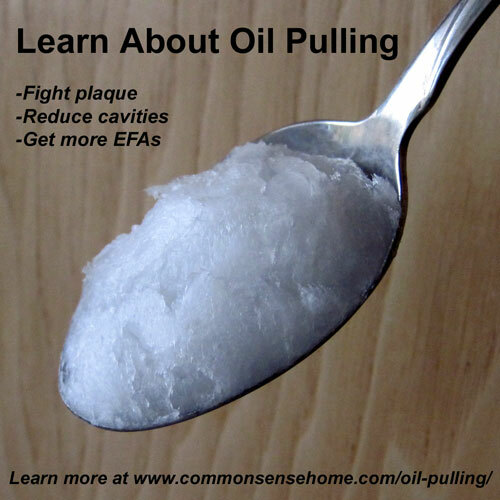 You can watch an oil pulling video if you still have more questions. Sunflower, sesame and coconut are the most common, but many other oils have been used. I prefer coconut oil. I normally use Nutiva. I keep a jar on my counter that I refill from my gallon container. On Earth Clinic, contributors discuss using sesame, sunflower, olive, walnut, macadamia, coconut, Udo’s Oil, Total EFA Oil and others. I have seen some references where people’s teeth took on a yellow tinge from using olive oil, so that probably wouldn’t be my first choice. Oilpulling.com recommends sunflower and sesame. Doesn’t putting a large amount of oil in your mouth make you want to gag, and doesn’t your mouth get sore from swishing? If swishing for 15-20 minutes is too much, start with 5-10 minutes and work up to a longer time period. You don’t have swish constantly – you can take a break now and then. Once you get used to it, it’s really not a big deal, but my cheeks were a bit sore at first. I usually oil pull as I am getting ready to shower and in the shower, when my kids normally give me a bit of privacy and stop asking questions for a few minutes. They’ve gotten used to mom responding in “mmmmm..hhmmm….hmmm…”. (“Oh you’re oil pulling, okay. I’ll come back in a few minutes.”) Then I spit in the shower or toilet. They also list a slew of others that may be helped. The Coconut Oil Research Center also endorses oil pulling. Personally, I’ve found that it makes my teeth feel smooth and clean, and has lightened some of my teeth stains but not removed them. (I’ve been using an herbal detox tooth powder and it stained my teeth quite a bit.) I notice that it helps clear out sinus congestion. After pulling for a while, the crud will literally work loose from my nose and throat area, and I can spit it all out when I spit out the oil. Oil Pulling for Detox? – maybe, maybe not. I suspect more will be found to show that the detox claims have some validity. I have read some accounts of people who have experienced mouth irritation from oil pulling. If this happens, discontinue, try a different oil or pull less frequently. Don’t swallow the oil, because it looks like it will be filled with dead bacteria and other things that are better out than in – not a yummy. Do you brush your teeth before oil pulling? Do know it's less effective to brush your teeth after oil pulling?